Hilton Head Island, SC — Professional Tennis Registry (PTR) presented its annual awards this week during the 2014 PTR International Tennis Symposium. The event, which includes 40-plus on court and classroom presentations for tennis teachers and coaches, a trade show and tournament, was held February 20-23 on Hilton Head Island, South Carolina. Michael Paul, of Murfreesboro, Tennessee, has been named PTR Humanitarian of the Year. An adaptive sports athlete who has been PTR certified since 2004, Paul has become a spokesperson for disabled veterans. It started with a cross country road trip, during which he pitched his idea to a fellow Delta Company vet he visited along the way. Paul wanted to get together for one last - or in this case lasting - mission! Through Paul’s passion, On Target 4 Veterans was born. Its staff is a group of patriotic Americans, mostly active duty and retired military personnel with a background in Special Operations. The nonprofit organization provides funds, support and mentoring to disabled veterans through adaptive sports, recreational therapy, and health and wellness. Paul personally mentors disabled vets in various sports, including tennis. He is part of On Target 4 Veterans’ development and strategic planning team, focusing on raising awareness and funds to benefit disabled vets. Paul oversees the organization’s finances and budgets, marketing and branding, and establishes policies and procedures to ensure full transparency of operations. Paul served our country as a paratrooper, and continues to serve through On Target 4 Veterans. Everything Paul does, he does with focus. He leads by example. In 2005, Paul received the PTR Golden Eagle Award. In addition to working passionately for On Target 4 Veterans, Paul competes in several sports, including tennis. His primary mission now is to show other disabled veterans how to live life to the fullest through sports, and to show our appreciation for the sacrifices they have made for our country. This is a battle we can help him win! 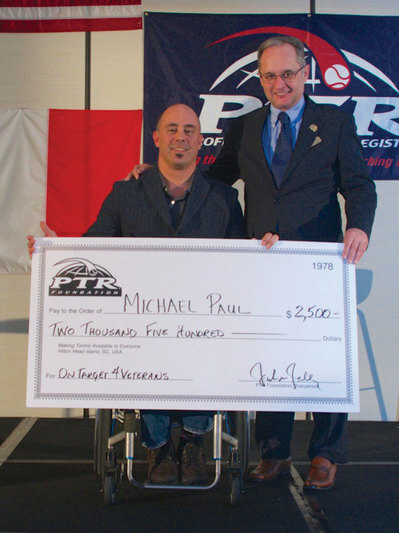 As the recipient of the PTR Humanitarian Award, Paul receives a $2,500 check from PTR Foundation Chairman, Scott Tharp, to continue his work with On Target 4 Verterans. PTR Foundation is the charitable arm of Professional Tennis Registry.